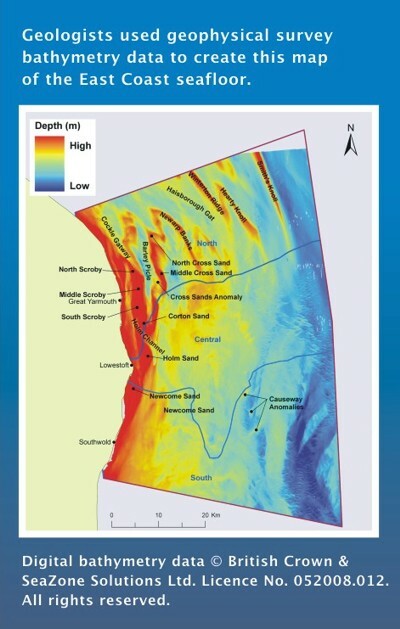 Geologists studied the formation and structure of the East Coast seafloor – how it was shaped, what the sediment cover on the seafloor is made of and what rock formations lie beneath the seafloor sediments. This information is vital to the RECs, creating maps of the seafloor for other scientists to use. Geologists use two main methods to study the seafloor and underlying sediments and rocks. Geophysical survey techniques use sound waves to map the seafloor morphology, the thickness of seafloor sediments and the rocks underlying these sediments. They also take samples of the seafloor sediments and underlying rocks, using grabs and vibrocorer to ‘ground truth’ the geophysical surveys. The geological maps form an essential foundation for the East Coast REC archaeological and ecological research and interpretations. They help identify where humans might have lived when sea levels were lower, exposing the seafloor, and on what type of sediment certain groups of animals prefer to live today. 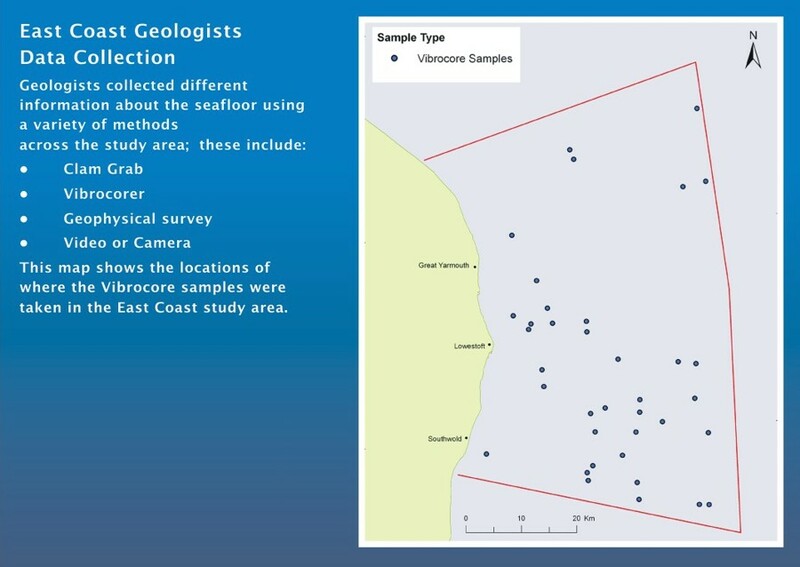 This section provides a summary of the East Coast REC results for the geological research. You can find out more about the role of geology in other areas of the REC research by visiting the East Coast Ecology, Archaeology and Sustainability webpages. An important task for the East Coast geologists is to understand the morphology of the seafloor. This involved creating a 3-Dimensional map of what the seafloor looks like. Geologists added the new geophysical survey data to existing datasets, to create a map of the modern seafloor. They effectively stripped away the water so that they could visualise the seafloor as if it were part of the mainland, complete with undersea valleys and hills. 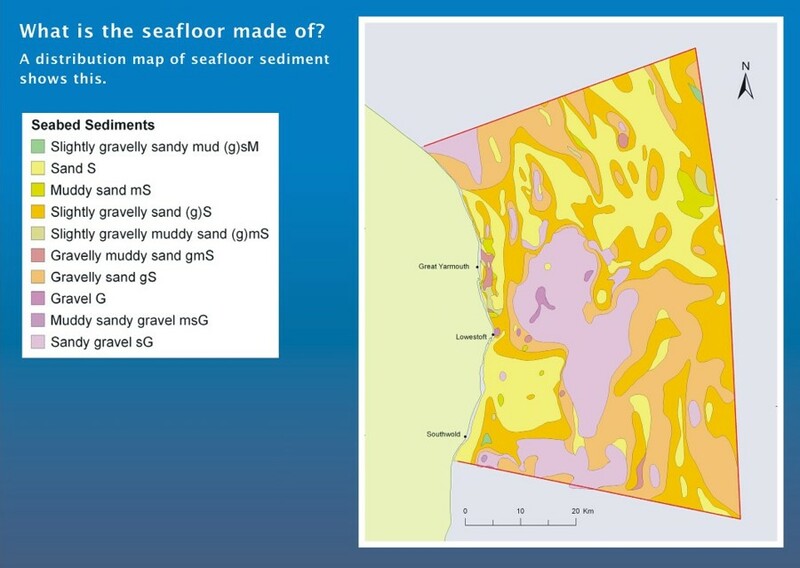 The map highlights many geological features on the seafloor, for example different types of sand bedforms created by the movement of the sea. 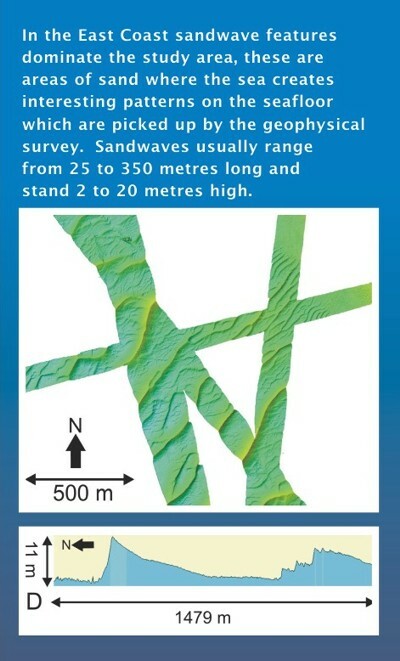 These include sandwaves, megaripple fields and sandbanks. In the East Coast region, sandwave and sandbank features dominate the study area. These form where sand accumulates, often because of the way the currents and tides interact with deposition of seafloor sediment. For example, very large sandbank features that can reach 20 kilometres in length and 1.7 kilometres in width are generally orientated parallel to the main tidal flow. However, the sandwaves, which can range from 25 to 350 metres long and stand 2 to 20 metres high, are usually orientated perpendicular to the main tidal flow. Therefore the features or ‘geomorphology’ of the seafloor can help tell us something about tidal flow and ocean currents, as well as showing us where there are large amounts of sand. The seafloor is formed of a layer of loose or ‘unconsolidated’ sediments. Geologists studied samples of the East Coast seafloor sediments to understand what they are made of. Out on the boat, geologists took seafloor sediment samples across the East Coast REC study area, using a range of different size grabs. In addition, they used geophysical survey techniques to measure the thickness of these modern sediments. The mapping of the seafloor properties shows that different areas are characterised by different types of seafloor sediment. For example, in the centre of the study area there is a large teardrop-shaped deposit of sandy gravel and gravel. Surrounding this, the sediments are mainly sand or slightly gravelly sand. 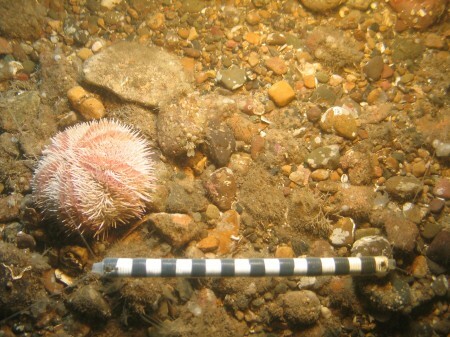 In the East Coast the seafloor sediments are often very mobile, meaning that they are constantly being moved or ‘re-worked’ by the tides and currents. These deposits are Holocene sediments, laid down during the last 11,700 years. Sometimes this layer is very thin, called a ‘veneer’, and overlies older deposits. You can find out about these deposits in the section below. On occasions the older deposits can be seen at the seafloor surface; this is called ‘outcropping’. Underneath the unconsolidated seafloor sediments, there are older geological deposits that the East Coast geologists also need to understand. To do this geologists use special equipment called a vibrocorer to push up to a maximum of six metres down into the seafloor and collect samples. Geologists also send sound waves deep into the seabed to create images of even older and deeper deposits. Underneath the loose seafloor sediments in the East Coast REC study area, there is a complex geology composed of a number of different layers. These deposits were formed during the Quaternary period of geological history which spans the time from around 2.6 million years ago until the present day. 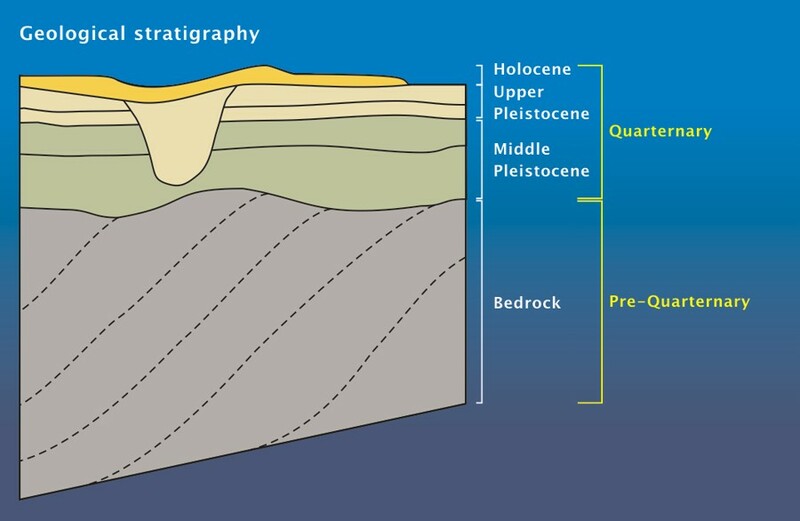 There are four main layers or ‘formations’ that lie beneath the seafloor sediments. The oldest is the Westkapelle Ground Formation, which was deposited approximately 2.3 to 1.6 million years ago. One of the most recent deposits, around 115,000 years ago, is the Brown Bank Formation. This was a silty clay deposited in a marine or lake environment which, in the East Coast area, commonly fills in channels that were carved out during the previous Ice Age. Beneath the Quaternary deposits lies true rock, called ‘bedrock’. This is the first cemented layer of the earth’s surface. It can be made of a variety of material, for example sand, chalk or granite. In the East Coast REC study area, a key bedrock deposit that covers the majority of the area consists of clays and silty clays called the London Clay Formation. This formation ranges in thickness from 76 to 150 metres, being thicker in the south towards the Thames Estuary. It was deposited during a time when the sea level was rising and lowering during a warm period around 48 million years ago. Geologists need to understand the geological processes that created the East Coast seafloor, over a period of time that spans millions of years. By understanding what has happened in the past, they can start to understand what might happen in the future, and how that will affect fishing, windfarm developments or shipping routes. Bedrock is formed when unconsolidated sediments are compacted and heated until they become solid. One of the oldest structures underneath the East Coast region is the London-Brabant Massif. This stretches from western Germany across to East Anglia and is a ridge made up of igneous and metamorphic rocks. 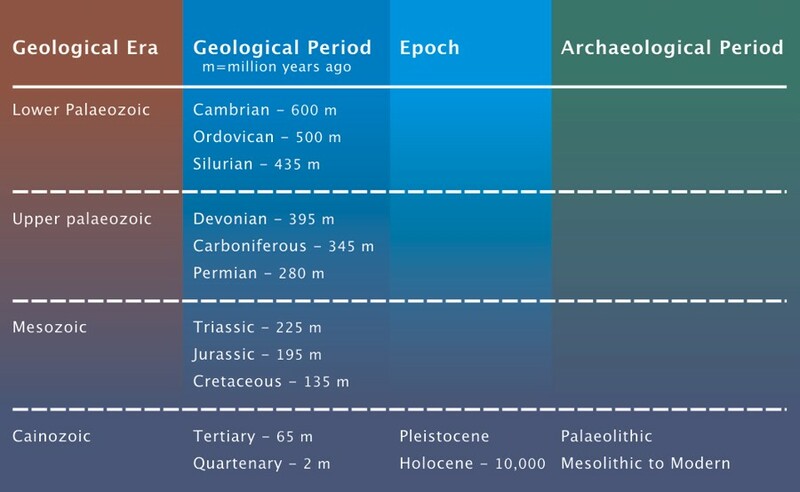 The biggest influence on shaping the modern day East Coast seafloor occurred during the Quaternary, when the southern North Sea experienced many different glaciations. 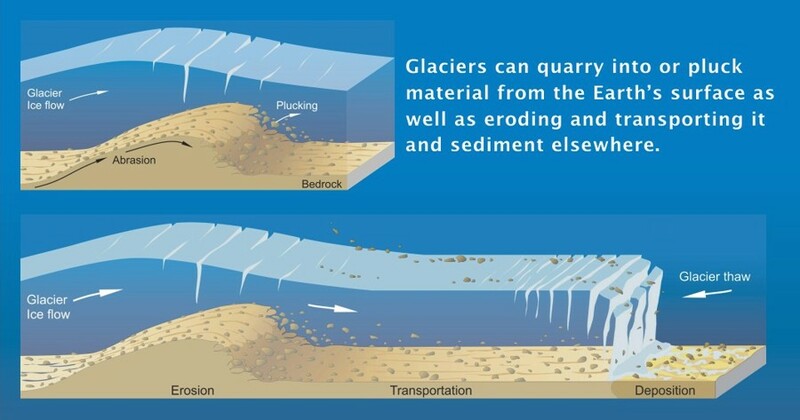 Ice sheets and glaciers eroded the surface of the planet, cutting deep channels and valleys in the older sediments beneath them, and moving sediment around to deposit in these large features. When there were ice sheets across Britain and the North Sea, sea levels were up to 120 metres lower than we see today, so at this time the East Coast REC area was predominantly dry land, with a complex river system winding its way through the region. Towards the end of the last Ice Age, approximately 15,000 years ago, the glaciers began to melt and sea levels began to rise. 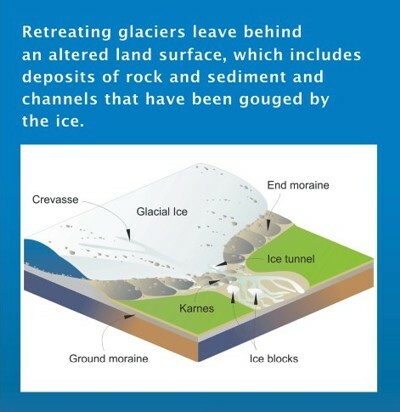 Features associated with the last glaciation such as glacial cut channels and valleys filled up with sediments, as the East Coast area became a shallow sea. As the climate continued to warm, sea level rose and by approximately 6,000 BP the entire area was flooded by the sea. The currents and tides since then have re-worked the old deposits, eroding them from some places and moving them across the seafloor and depositing them somewhere new, creating the bedforms and sandbanks we see today. In the west of the East Coast REC study area, strong currents have removed the finer sediments, called ‘winnowing’, which leaves the larger and heavier gravel deposits behind. Today, the continued activity of the currents and tides, combined with changing sea levels as the climate fluctuates, will mean that the sediment distribution and seafloor morphology will continue to change and evolve in the future. Any change will affect the habitats of the sea animals, whose presence and distribution are dependent on the type of seafloor sediment. You can discover more on our Sustainability webpages.